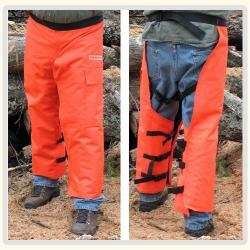 The Forester Wrap Style Chain Saw Chaps come in 3 sizes. Chaps are designed to protect the entire leg in the most commonly injured areas. With 12 layers of protection yet lighter weight when compared to other chaps. The 3M ® company makes the Ballistic Fiberglass Mesh material for us. It meets all the new OSHA and ANSI classifications, and they are UL approved. These have a water and oil resistant oxford outer. All our chaps have an adjustable waiste up to 48"
Great chaps and lightweight. I like having the extra coverage around the leg. Very adjustable and comfortable in the field. I'm a 33" inseam and the 40" chaps fit perfect and reach to my ankle. You can also adjust the chaps shorter by 2 inches. The green is a nice dark forest green. Review of wraparound chainsaw chaps, size 36 overall length. Did a lot of research on the Internet looking for set up chaps. And finally found forester chainsaw parts,let me start off by saying the chaps are extremely well-made and rugged feeling, one bonus was the waistband has buttons on it Where you can folded it over and snap it. And make the total Overall length size around 35 inches,so overall I feel this is a great product. Also very fast shipping and well packaged.